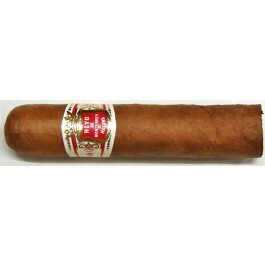 The Hoyo de Monterrey Petit Robusto is a smooth and refined Habano, 4" (102mm) long, of 50 ring gauge, and comes in a 25 cigars box. The first third starts out with a little pepper, wood and earth with hints of leather. Starts the way some cigars start their final third. A small puff yields a mouthful of luscious smoke. By the middle the cigar turns to sweet hay more fruit and leather with some tobacco in the background. The finish gets great, rounded out with a meaty, sautéed mushrooms and tobacco flavor. No bitterness detected at all. You hate for it to end while you burn your fingers.